Make 24 cards using the Roof Garden Accents and Elements (plus the coordinating cardstock and ribbon). These great adhesive die cuts coordinate with Basic Gray, Kiwi Kiss, Baja Breeze, and Not Quite Navy. (Envelopes are not included.) 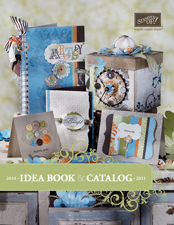 Class price is $30 and includes your very own Roof Garden Accents and Elements tin. You will have the flexibility to split these cards up in sets of any number you like to give as gifts throughout the holidays (or use all of them yourself). 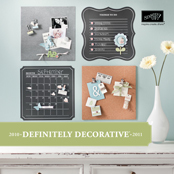 Create a Calendar for your use or to give away as a gift! You will use the Create-A-Calendar ’09 kit plus the On Board 4-1/2” x 9” clipboard, patterned paper, and the Holiday Blitz stamp set to create a beautiful, handcrafted calendar for the new year. Class Price is $25 and includes adhesives, ribbon, and a magnetic strip to attach the clipboard to your refrigerator (or other metal surface). Saturday, November 15 from 10 a.m. until 2 p.m.
Sunday, November 16 from 1:30 p.m. until 5:30 p.m.
Come by during the times above. You’ll need between 1-2 hours to complete each project. Enjoy the good food and get some of your Christmas shopping done early! R.S.V.P. by Monday, November 3 to sarahayes@windstream.net (pre-payment required). Join me on Sunday class, October 19, for a Christmas Card Buffet! Stop by anytime between 1:30-5:30 p.m. to make as many Christmas cards as you would like. The cost is only $1.50 per card (with envelope). You will still be able to choose from the four designs below in addition to a 5th surprise design. Please RSVP if you will drop by. Both classes will be held at my home. If you LOVE the card designs but can’t make it to either of the classes, I have one more option for you. This is the first class that I am introducing a CLASS BY MAIL. I will include full color step-by-step directions for you to assemble the cards on your own. Just add $4.75 for Priority Mail shipping. Email me by October 15th. I will ship all kits at the end of the month.